BooBoo Kitty Couture: Good Hair day.. I haven't washed my hair since last Wednesday, but i am having the best hair day ever! My secret.. dirty hair! 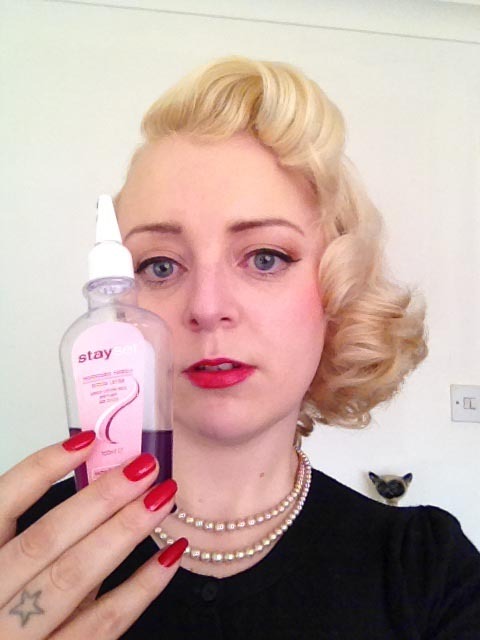 Firstly, i did a rough wet pin curl set after i washed it on Wednesday. My hair wasn't soaking wet, but damp. I did it without a mirror, whilst watching TV. I didn't think i would work so i didn't put any setting lotion in it. But to my surprise it did! Here it it the next morning after i took out all the bobby pins and brushed it out. I sprayed it with hair spray and took the dog for a walk. It was such a windy day, but my curls survived! That night i re-pinned my curls, a quick squirt of setting lotion mixed with water. In the evening, i re-pinned them again, squirt of setting lotion and the hair net went on. Day three was a wet and windy miserable day. 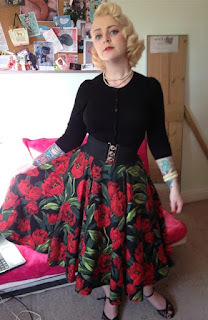 I spent the day going round vintage shops with Rose Desire, my Burly friend. Then we went for lunch. Hair, sort of lasted the day, but looked a bit wind swept and frizzy. This might explain why my hair looks so good today. On Sunday, day four, i kept my hair in pin curls and the hair net all day. I had a steamy hot bath, which also might have added to my curls staying power. With the help of my bottled buddies, dry shampoo, styling powder and hair spray. I have had the best hair day ever! Its a bugger that its a Monday and the only thing i did today was go into town, and havent had a chance to show it off to anyone who really appreciates vintage hair! Oh well i will learn for next time.... if i want good hair on a Saturday night, plan it five days in advance! Quick out fit post... and the other half came home just as i am writing this post so he can take one of my full out fit. Now i think you've had enough of seeing my face by now, that was a very photo heavy post! Gorgeous! I am so jealous!! :D I like your skirt. Hi hun just stumbled on your blog and I love it. It's very inspiring. Love, love, LOVE the necklace from day one photos! I hate washing my hair and I agree, dirty hair makes the best styles. your hair looks absolutely friggin amazing!! I agree, sometimes a bit dirty hair works better than soft freshly washed haor, I may have to get my curlers out now after seeing your success!! very well deserved to you! Great blog and I love the hair! I am trying to wash my hair less but with a normal 9-5 job I cant wear my vintage stuff to work so have to wash it every other. Gonna try dry shampoo though! Feeling sorry for myself ..